BOCA RATON, FL (May 10, 2012)–As the host of the first stop in the Annual Travel Rally Road Trip Day throughout Palm Beach County that was navigated this week by Palm Beach County Convention & Visitors Bureau and United States Travel Association, Downtown Boca joined more than 100 destinations nationwide in celebration of the 2012 Travel & Tourism Week. The festivities were held in Plaza Real At Mizner Park, the public “park within the park” that has been designated one of the “Top Ten Great Public Spaces” in America by the American Planning Association. Literally “rolling out” a 10-foot by 8-foot welcome mat for visitors near and far, Downtown Boca businesses, city and county officials, and community, business and tourism leaders gathered to celebrate, showcase South County’s tourism assets, and rally for visitors. Spectators were “seeing red”, as participants wore red or their company shirts or uniforms to symbolize their hospitality spirit and tourism pride. A fun, interactive and very “visual” showcase of major destination tourism drivers awaited guests, spotlighting the area’s world-class museums, dining, shopping, hotels and resorts, cultural and culinary festivals, sporting events, nightlife, concerts, and entertainment. There was informal modeling of “upcycled” couture fashion by designer Maria Dopozo that was created in the Boca Raton Museum of Art’s Fashion Illustration Class With Instructor Amy Berkowitz, a 17-foot x 17-foot inflatable driving range presented Allianz Championship, Florida Atlantic University mascot Owsley with football players, Boca Ballet Theatre black swan ballerina from the classic Swan Lake, costumed actors from FAU Festival Repertory Theatre, exhibit by Gumbo Limbo Nature Center, Boca Raton “pioneer” from the Boca Raton Children’s Museum,information on Lynn University’s hosting of the final presidential debate of the election year, Fred Astaire Dance Studio of Boca Raton instructors leading the official “Downtown Boca Bop” line dance and more. Visitors joined in the first official Travel Rally welcome photo as a large crowd of South County “cheerleaders” showed destination hospitality. During her remarks, City of Boca Raton Mayor Susan Whelchel reported that 25% of the county’s hotel inventory is in Boca Raton with 3,891 hotel rooms with Boca Raton as home to the largest hotel between Miami and Orlando — the Boca Raton Resort & Club — which continues to lead as the number one bed tax contributor in the county. She then applauded the City’s key tourism drivers that include a revitalized Downtown Boca with a newly constructed and landscaped pedestrian promenade that connects the downtown community for easy and enjoyable strolling; Lynn University as the site for the presidential “Debate in Paradise”, Florida Atlantic University where President Obama recently made a nationally televised visit and the home to a new state-of-the-art stadium, and the annual Allianz Championship PGA Tournament that draws more than $15 million in economic impact and generates more than $1.2 million in news coverage of Boca Raton with televised household reach throughout the world. She noted that the annual Festival of the Arts BOCA has intensified the international cultural spotlight on Boca Raton and Downtown Boca bringing star after star, year after year from music, literature, film, art and dance worlds to the Mizner Park Amphitheater. Boca Raton City Council Member and Community Redevelopment Chair Constance Scott focused her bragging specifically on the Downtown Boca destination, exulting its world-class shopping, dining, culture, entertainment, nightlife, family activities and special events and programming, such as the Friday Night LIVE! entertainment series, Saturdays@Sanborn fitness program, Meet Me On The Promenade community street festival set for October 26th and 27th, and more. As a cultural hub, Downtown Boca is home to several museums, including the world-renowned Boca Raton Museum of Art, Boca History Museum, and Boca Raton Children’s Museum with its new Music Hall, and its Mizner Park Amphitheater draws live concerts, performing arts performances, and film and culinary festivals. 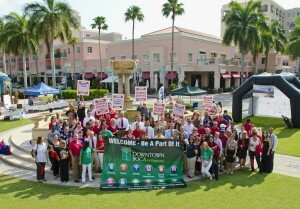 For more information on all there is to see and do in Downtown Boca, visit www.downtownboca.org.